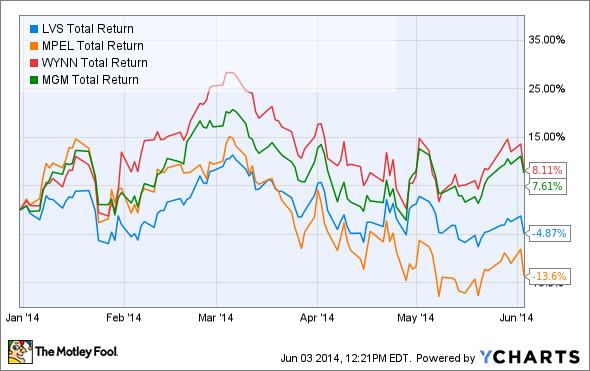 Macau's growth slowed in May, but that isn't a reason to panic sell your gaming stocks today. Gaming stocks are down big today after Macau released May gaming numbers. Overall gaming was up just 9.3% for the month, hitting $4.05 billion. That's an impressive growth rate, but it follows months of 40.3%, 13.1%, and 10.6% growth from February through April, so the numbers are trending lower, and fell below Wall Street's 14.5% estimate. The reaction was to kick Las Vegas Sands (NYSE:LVS), Melco Crown (NASDAQ:MLCO), Wynn Resorts (NASDAQ:WYNN), and MGM Resorts (NYSE:MGM) lower, making a bad year worse for the first two. But before you run out and sell gaming stocks, let's put this into perspective. While growth slowed a bit in May, gaming revenue is still up 15.8% in 2014 through May. That far exceeds markets like U.S. regional gaming or Las Vegas, which are struggling to grow by mid-single digits. Even high single digits is good growth, and with capacity limited in Macau until new resorts open up it's probably what investors should expect. Macau's growth may not be all that impressive until new construction like City of Dreams' new tower are completed. Image courtesy of Melco Crown. Last year's growth of 18.6% will be tough to match, but Macau is still a strong growth market -- so operationally I wouldn't be worried about these companies. The question mark is value for investors. Melco Crown, Las Vegas Sands, and Wynn Resorts are all trading with an enterprise value/EBITDA of just over 13, which is high even for a region growing at double digits. That's why their stocks can move lower quickly when growth doesn't meet expectations. MGM is a little cheaper at 10 time EBITDA, but keep in mind that it's most focused on Las Vegas, which is barely growing. At this value and growth gaming stocks aren't a screaming buy, but I'd look at any pullback as a buying opportunity. Each of these companies have great growth prospects in Macau, and if you can get them at lower prices they're long-term buys. As I pointed out last month, I think MGM has the most upside, with Wynn providing the best value, but even buying a basket of all four would be a great way to get exposure to gaming.